It seems for every scientific advance, there is a price to pay. I remember the frustration when the magnetic strip of a credit or bank card wore and no amount of rubbing and polishing would revive its ability to be read. We would sigh, pull out another card and apply for a replacement for the defective one. Now we have RFID (Radio Frequency Identification) chips embedded in all sorts of things (including many new credit cards and passports) which allow the information to be read at a distance of several feet and even when the chip is not visible. Great! Except if you are standing in a queue and the cashier picks up your details while processing someone else's purchase. It happens and it causes no end of trouble. The other scenario is even more concerning: an identity thief can pass you in the street, point a concealed scanner at your wallet, and collect vital details which will allow stealing of your identity and your money. So now we need protection from these hypersensitive readers and easily-read chips. There are different products that attempt to address the problem: one is a metal case designed to house a number of cards; another is what we have here, individual sleeves to store a single card, plus a larger one designed for your passport. 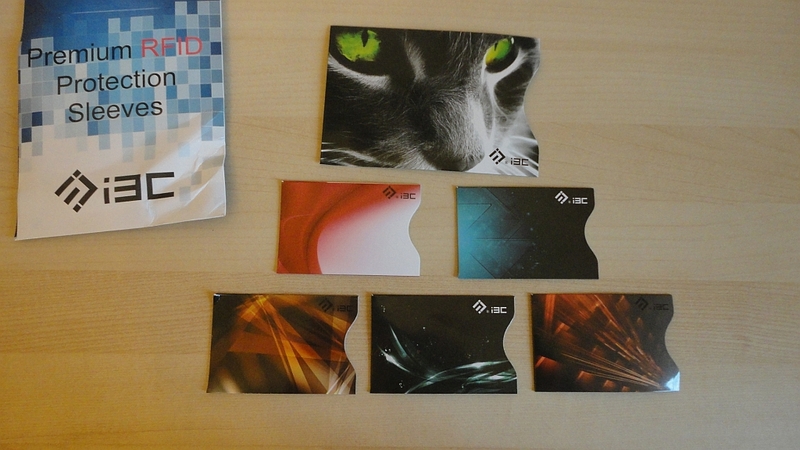 This colourful set of five card sleeves and one passport holder were sent to me for evaluation. For a visual standpoint, they look great. Each one is different in colour and design, although they all share a certain funky sleekness. I particularly like the cat's eyes on the passport sleeve. 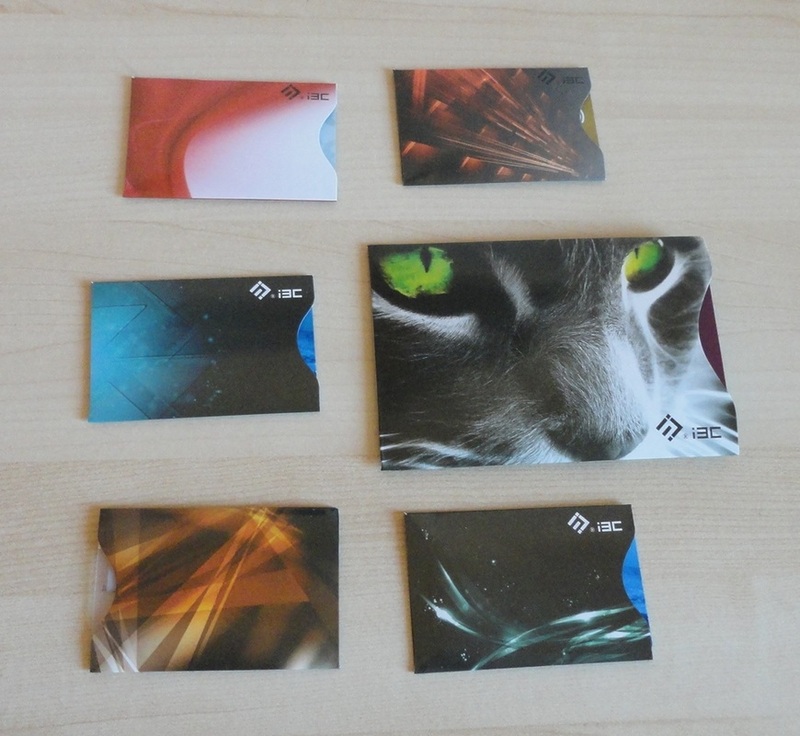 They are a tight fit on purpose so that the sheathed card will hopefully still fit inside your wallet. 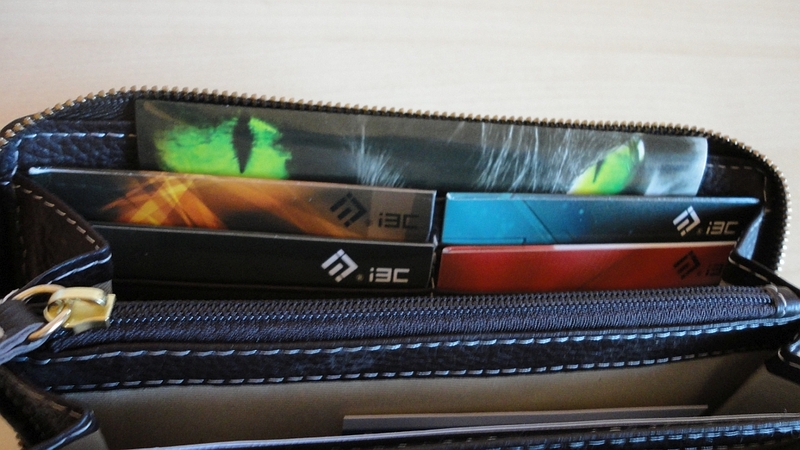 I can confirm that these sleeves work with my wallet, just. They may not fit all wallet slots as they make the card larger. Pulling the card out is not difficult but there is no chance of it falling out. I have not had a chance to test the effectiveness of the sleeves in blocking the interrogator signals, so will have to go on trust for the moment. If you don't like any of the designs, this vendor offers the option to customize blank sleeves by sending in your photo. It's a fun option and it sounds easy enough, although it entails a delay. It should be noted that there are some exceptions and some card types are not shielded by these sleeves. As of the date of this review, the note reads as follows: These sleeves do NOT shield the following card types: Older "prox" cards, HID 125 khz, including ProxCard II, ISOProx II, DuoProx II, Smart ISOProx II, Smart DuoProxII, ProxCard Plus - Indala FlexISO, FlexCard, FLex Tag. This may change, so please read all the product description.